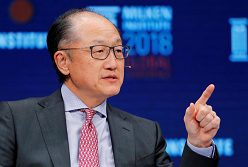 The Obama appointed World Bank President Jim Yong Kim has announced his early retirement to make way for a Trump appointed CEO in The Bank. There’s a deeper, behind the scenes maneuvering in the world’s financial sector that is shifting paradigms and people across various organizations. Jim Yong Kim was nominated by former Deep State US President Barry Soetoro. The World Bank came as an engineered solution to bring global peace and shared prosperity after injecting World War 2 on the planet. It was the Vatican, which gave direct instructions to the Nazis on how Europe be plundered, in much the same way as Japan was pushed to go to war to plunder the wealth of its Asian neighbors. After this was done, the US forces under the command of Gen. Douglas McArthur interrupted a Japan’s victorious return by cutting off its supply lines across Southeast Asia, forcing the Yamashita to bury his Golden Lily loot in the Philippines. This elaborate operation was hatched to specifically establish the Vatican as the ultimate center of global power. World War 2 came when most of Asia refused to give in to a blatant Western extortion. World wars are, of course, an avenue of last resort for globalist control. The Vatican does prefer a less destructive approach to unite the world’s people under its thumb by using fear against terror, HIV-AIDS, climate change, and economic collapse. US President Donald Trump is known to hate the climate change hoax, and WB President Kim supports the Paris Accord on climate change. It is speculated that, since the US Treasury is just a walk away from the World Bank NY headquarter, it would not be impossible for the Trump administration to apply pressure from the WB leadership. The Paris Accord on Climate Change requires the already economically compromised G7 countries to contribute to the Third World economic development. But since China’s Belt and Road Initiative is already doing that away from the mainstream media coverage, there’s a great doubt about where this G7 climate change fund would actually end up with. Another fundamental reason behind Kim’s resignation is the fact that most, if not all, countries that formed the backbone of its existence are now expatriating their gold reserves from New York. The global economy is now favoring countries with the most gold and silver reserves. This includes Russia, China, Iran, Turkey, and most of the Southeast Asian countries. This explains why there’s a great divide between the value of stocks in exchanges across the Atlantic and the real economy on the ground. … and there’s a room full of these bonds just in this Imelda penthouse alone. We have yet to talk about the gold bonds from the Sultanate of Sulu, i.e. the Kiram family, which runs into at least a million of tons. In the above video, Duterte confirmed that the Marcoses are talking to him with a promise that they will return the gold, at least “those that have been found,” to the government. The Marcoses are under constant Vatican threat of revealing the real story behind their gold stash in various Rothschild dynasty-controlled central banks around the world. That is the reason why the Jesuits are seeking the collapse of the Duterte government. But Duterte’s popularity continues to be stable at +75% net rating. This unprecedented popularity is there in spite of his regular anti-priesthood attacks within crowds of Catholics. It is, of course, very evident among Asian cultures to share their wealth among peace loving races on the planet. Unfortunately, the Khazarians have gained greater control over the Western governments that allowed them to use its armies for endless wars abroad. It’s time for the Western people to take back their own governments and join the peaceful, cooperative template now in place in Eurasia, i.e., the great revival of the ancient Silk Road, where cultures and creativity collide. Kim told World Bank employees in an email that he was leaving the world’s largest lender and donor to poor and middle-income countries on Feb. 1 to join a private-sector firm focused on infrastructure investments in the developing world. Kim said details about his new job would be released later. The physician and former Dartmouth College president said he would also rejoin the board of Partners in Health, a health advocacy group he co-founded 30 years ago. Can the Galactics please remove via teleportation the bad actors so we can end this duality game?